There are some really good photo-etch bending tools on the market, with my personal preference thus far being the 5.5 inch Hold and Fold from The Small Shop. I’ve used numerous different folders over the last year, some being good and some being a little iffy, in my personal opinion. 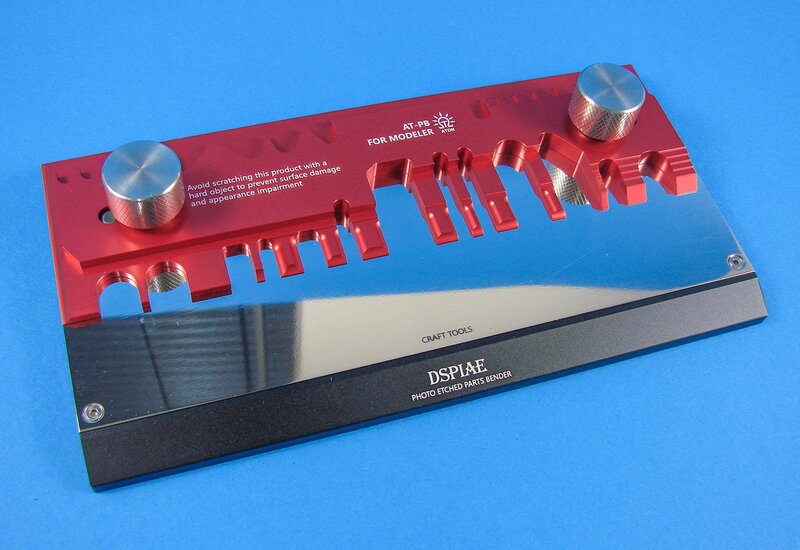 I suppose it was only a matter of time before Chinese tool manufacturer, DSPIAE, released their own into their high-quality tools range, and here is that very tool. 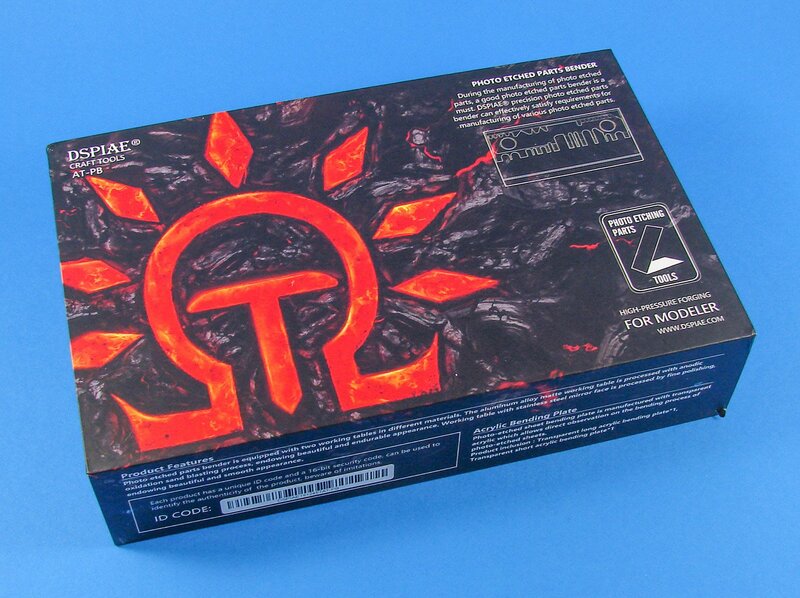 DSPIAE tools are packed into robust and attractive boxes of MDF construction, with rather random Aztec-style imagery that really doesn’t bear any relation to the product within. 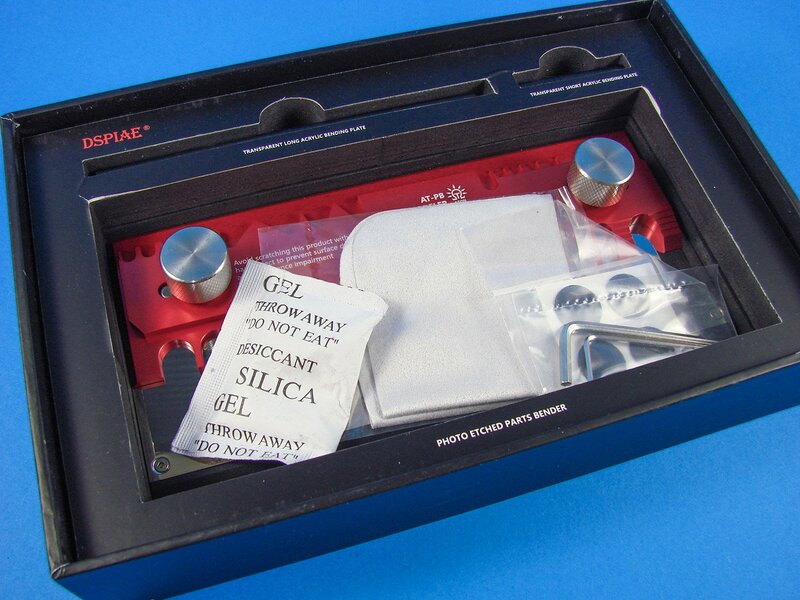 Still, there’s no faulting the presentation, along with the excellent packing that can be used to safely store the tools for many years to come. The box states that the contents within, or at least some of them, are a result of high-pressure forging. 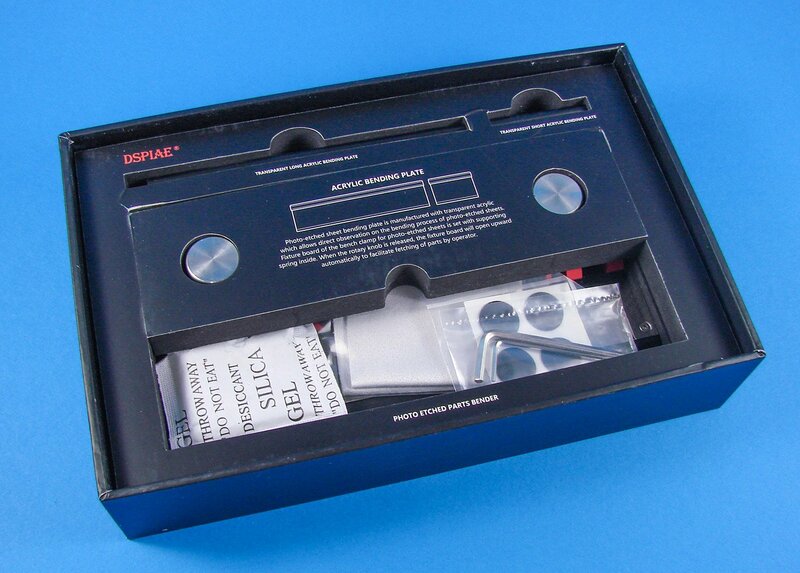 The box sides show the parts included within the tool set, plus the ID Code used to identify this as a genuine DSPIAE tool and not a pirated copy, with this latter being something that even the respectable Chinese companies have had to do to separate themselves from their more unscrupulous countryfolk. 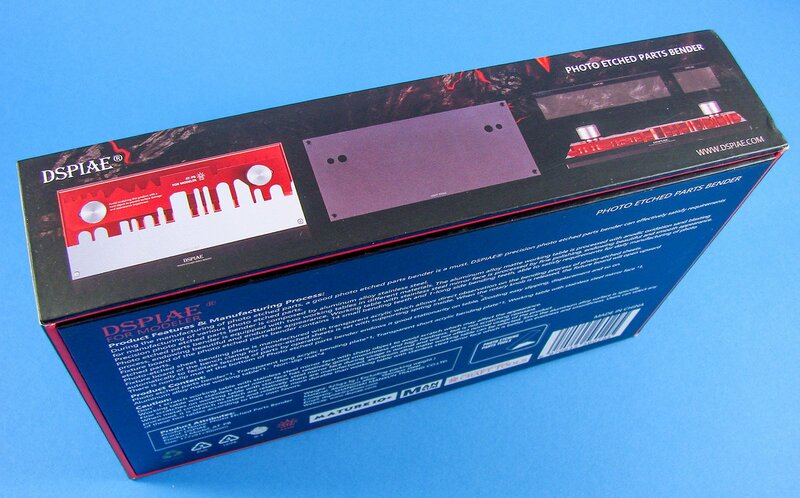 Taking a look at the back of the box, we see some general product information and rationale for specific product design choices. Got to love the inclusion of the Ghostbusters logo! Lift that heavy lid and you’re already getting a thank you from the company for your tool purchase decision. Another product authenticity check is included in the form of a Q-Code that can be scanned with an appropriate app on a smartphone. 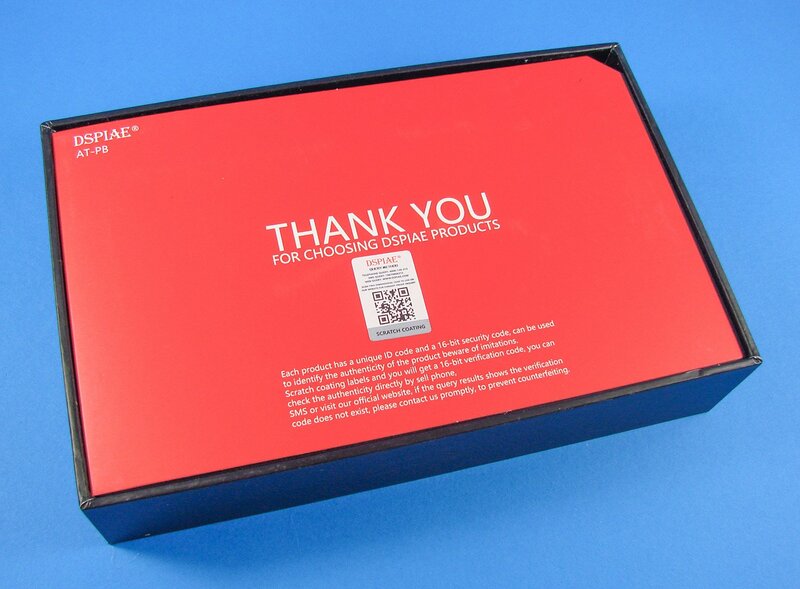 This red packaging is actually a sleeve that contains one of the tools working tables, as named by the manufacturer. 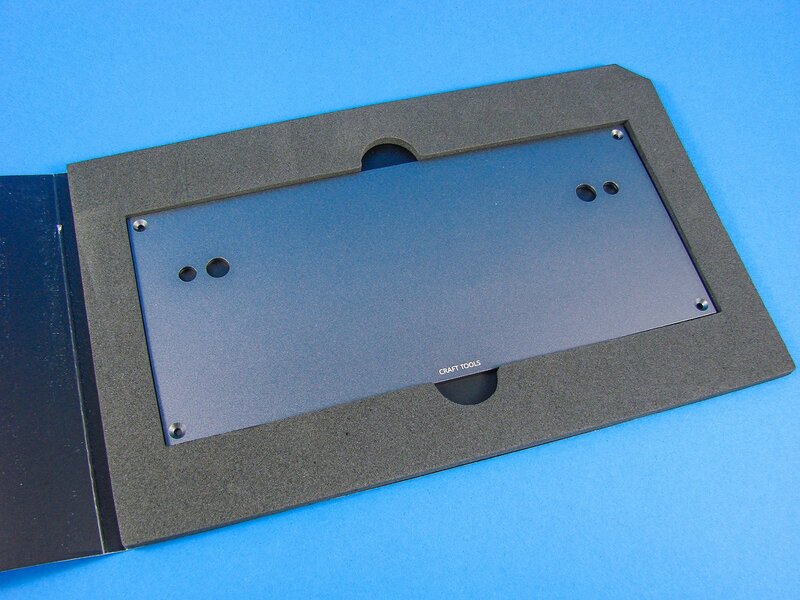 Yes, this PE bender has a choice of two working tables, and the one in this sleeve is manufactured from a shot-blasted piece of anodized aluminium that has a sort of graphite colour to it. 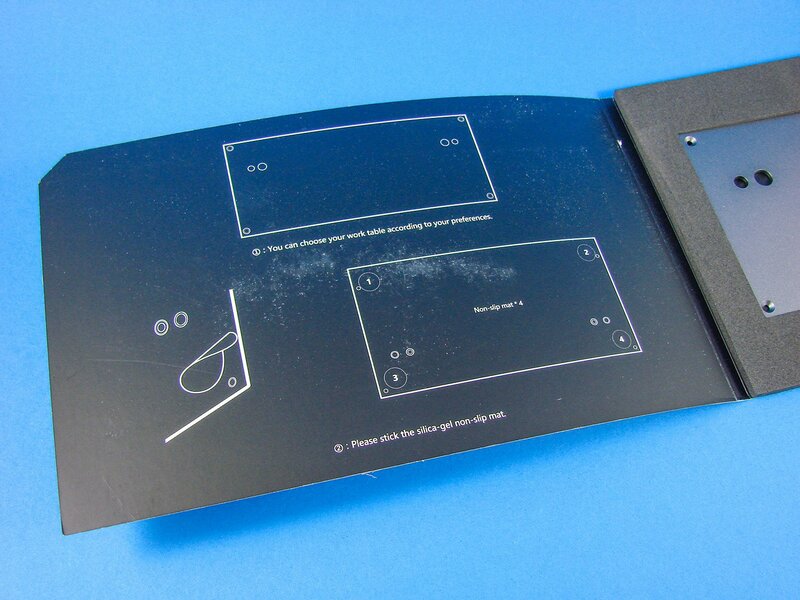 This is also protected by a foam cut-out within the sleeve. 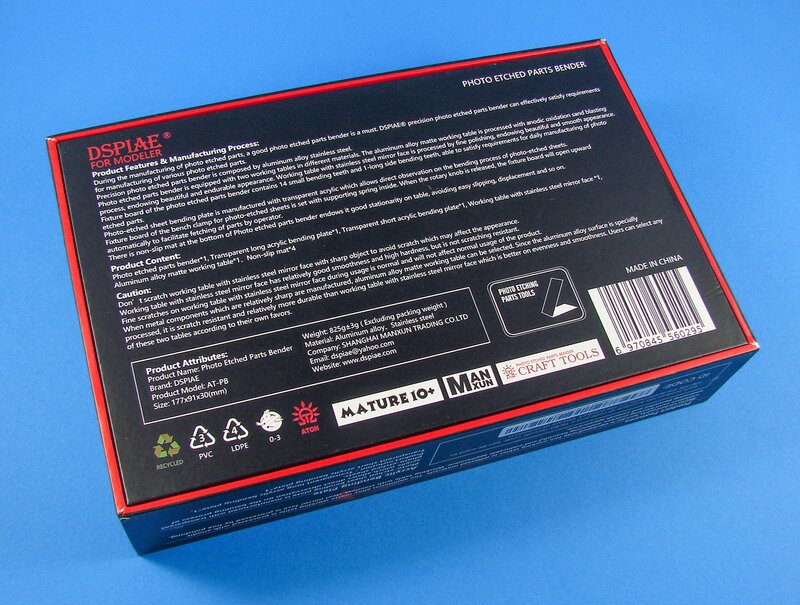 On the rear of the sleeve is a little more of the same product information we saw on the rear of the box, alongside line drawings of the product. 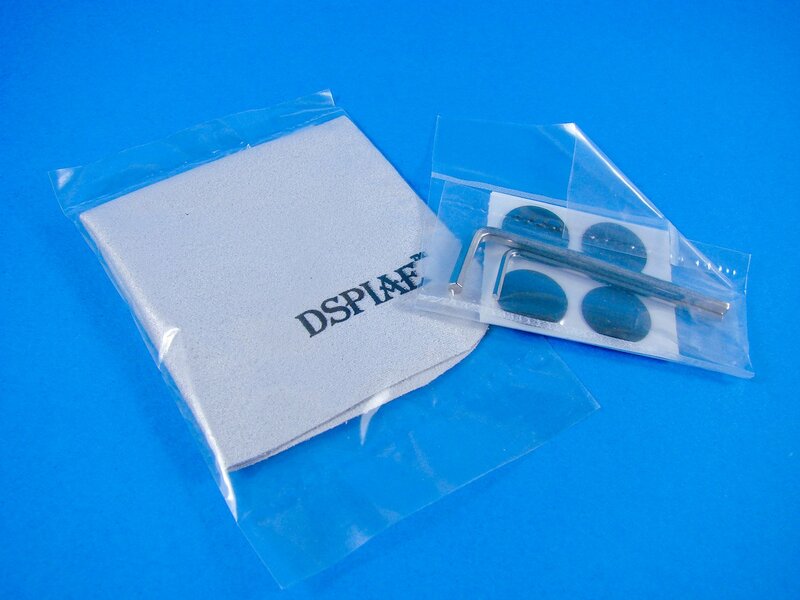 One thing that can never be criticised with DSPIAE is their packaging. 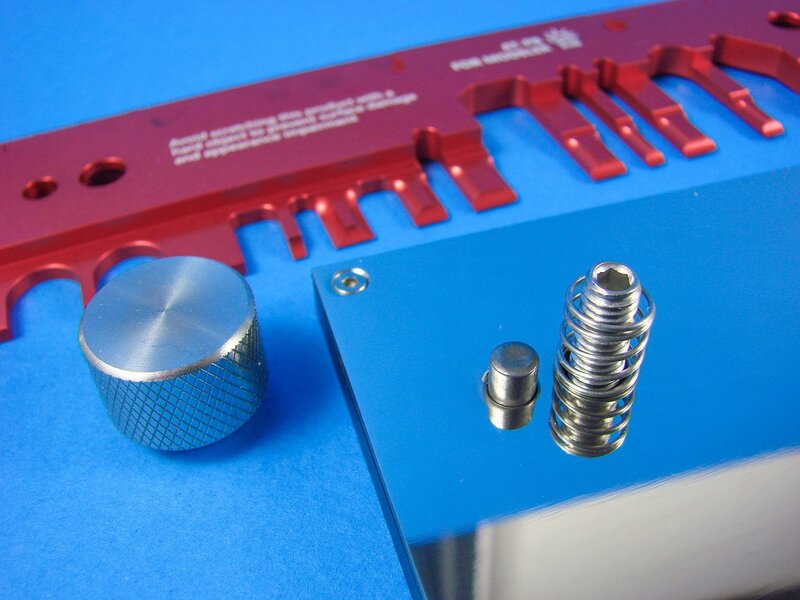 The tool and parts within the box are sat in foam cut-outs with another insert being used to span the area between the bending plate release knobs. A silica gel sachet is included to prevent any moisture damage. With other PE benders, I’ve been used to a metal blade to assist folding any of the longer bent edges. 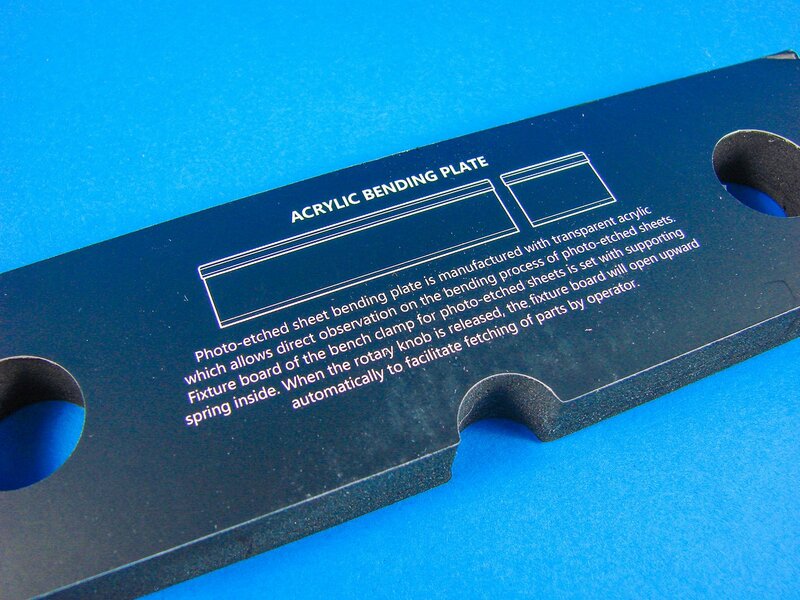 Unusually, with this tool, the folding tool (or bending plate as described by DSPIAE), is constructed from clear acrylic sheet which has been neatly and evenly ground down to a wedge end, and with a black plastic cap strip along the other edge. In fact, they actually supply two folding tools here, with one of them being quite short in relation to the main folder. It remains to be seen how these bear up to continued use as opposed to a metal item but remember that it’s not much effort is generally needed to make these bends, and you aren’t pushing and grinding these parts together. 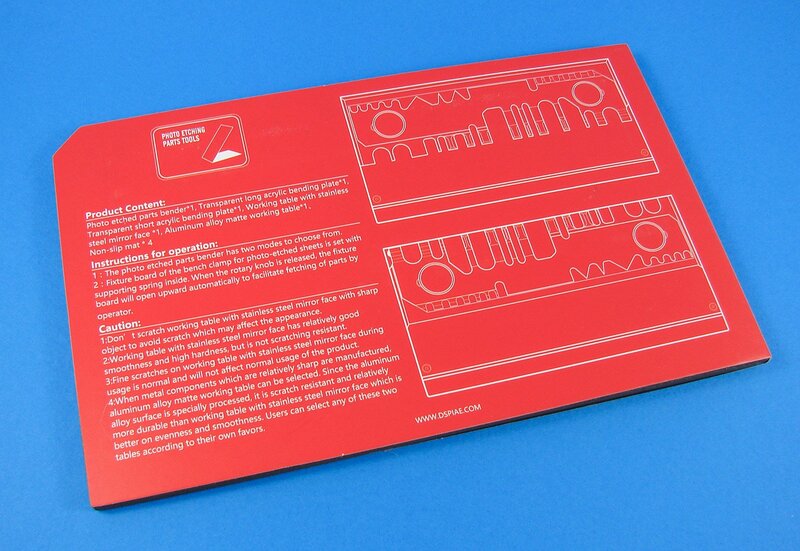 More rationale for product design is also given on a foam insert, and also some information on how the tool is used. Time to get our hands dirty and take a closer look at this. 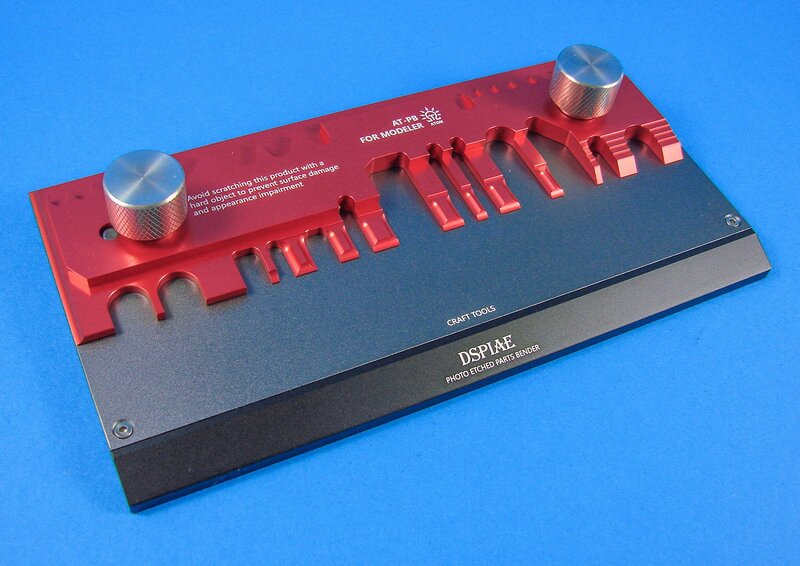 No doubt, this tool must surely win a prize for the most beautifully finished and aesthetically pleasing tool that will end up on your workbench. The main bed of the PE bender is machined from high-grade aluminium which has been finished in black anodising and has a recess into which the switchable working tables will fit. 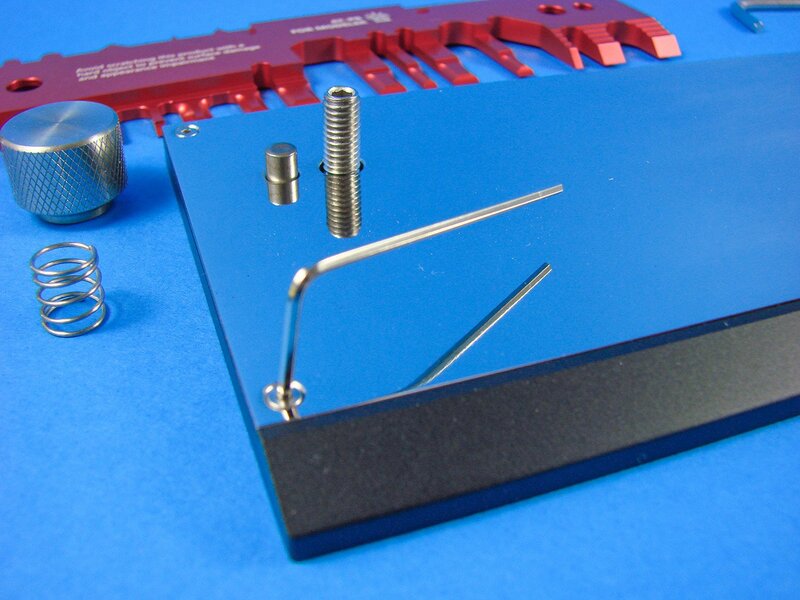 Four hex-key screws hold the default working table in place. 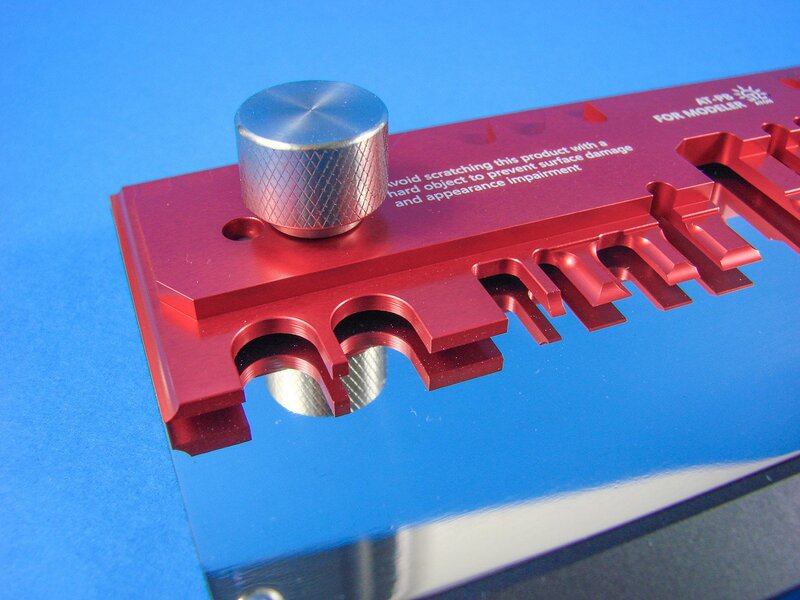 Unlike the shot-blasted, anodised aluminium plate that was packed into the sleeve, this plate is constructed of stainless steel and has a high mirror finish that was a little difficult to capture clearly in my photography. 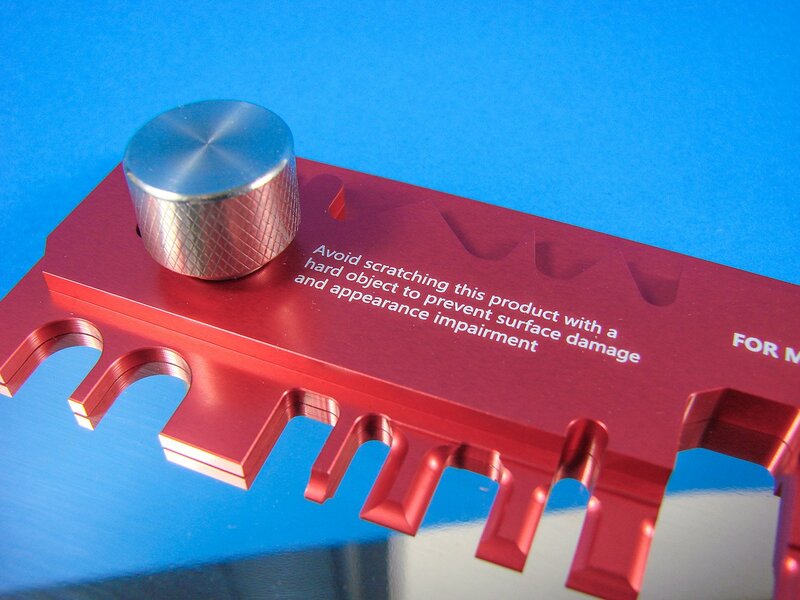 The bending face is constructed from more high-grade aluminium, this time anodised in the companies trademark red colour. This has more bending options than my default 5.5inch Hold and Fold, with the various shaped being precisely machines, as with the US-equivalent tool. Two knurled knobs hold down this pate onto the working table, with the plate itself being sprung-loaded. The being plate can also be lifted off and turned around 180 degrees so that the long straight edge is the principle bending face. This unit is also larger (and heavier) than my usually tool. The larger size does account for that generally, but the stainless working table adds to this, unlike my usual tool which is simply a two-part item which is also sprung-loaded. 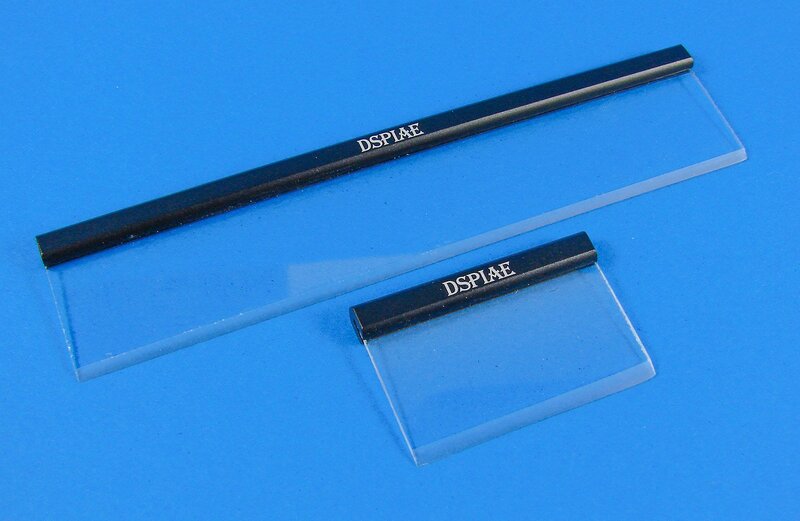 DSPIAE’s tool has a length of 177mm and a width of 91mm. 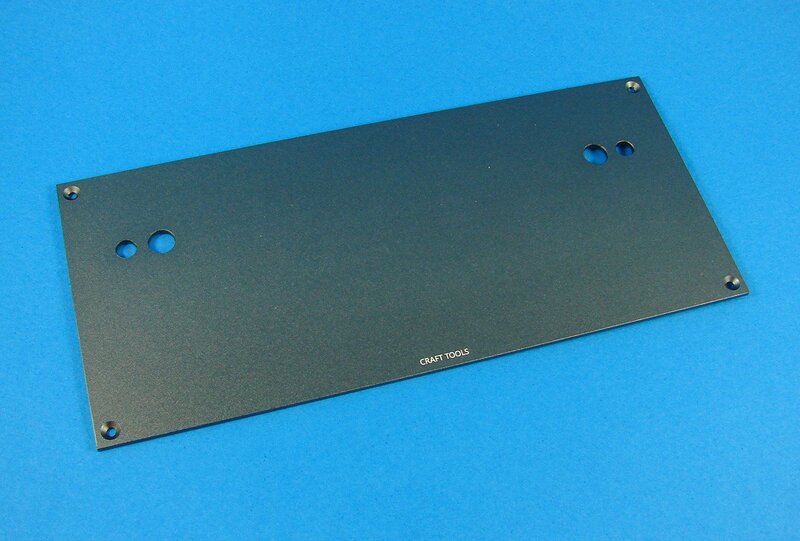 Note here the smaller machined bending locations that can be used in conjunction with dowel or metal rods/drill shanks. 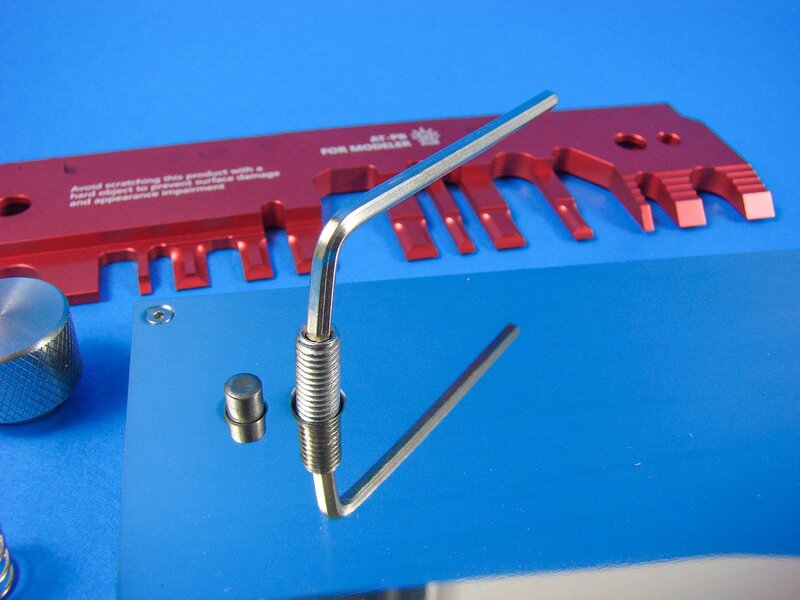 A hex key is also supplied for you to tighten the threaded knob screws, should they ever come loose. Here you can see the difference in the working tables. 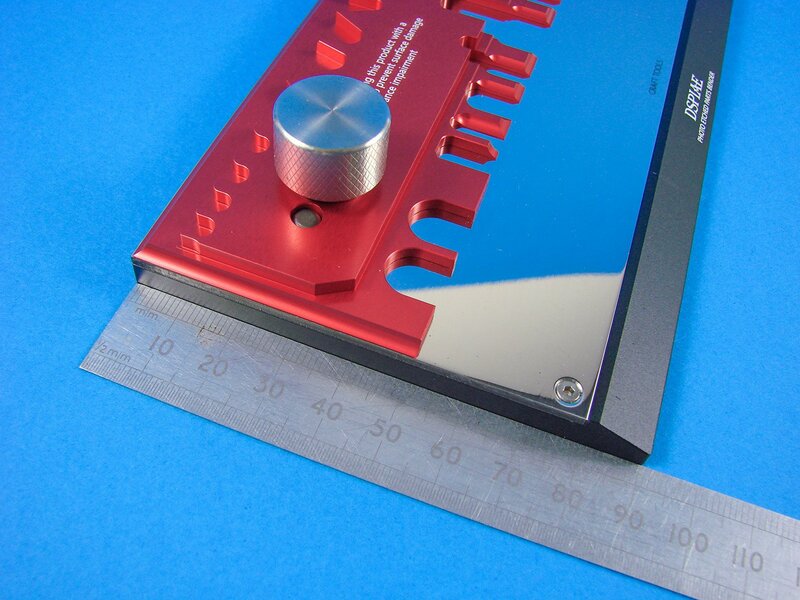 There is some notation about the mirror finish being easier to scratch (obviously) but that won’t impair the quality of the tool and how it works. I think the choice between these two items is more one of personal choice than how the tool actually works. 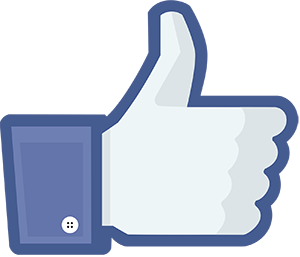 If you ever inadvertently damage one of these, then at least you’ll have a backup. To help maintain that mirror finish and keep things clean, a neat polishing cloth is also included, as are a set of sticky feet made by 3M. In the same wallet are the two hex-keys that we’ve seen in use in this review. 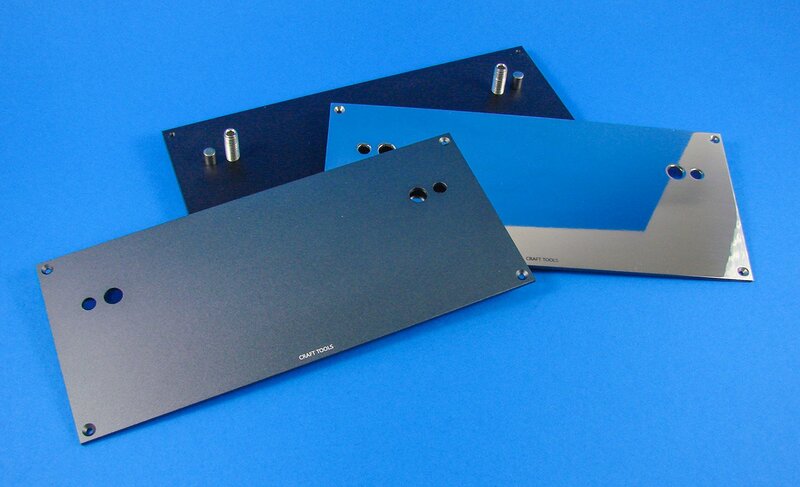 Aluminium or mirror-finished working plate, the choice is up to you! Here you can also see the bending face turned around 180 degrees. 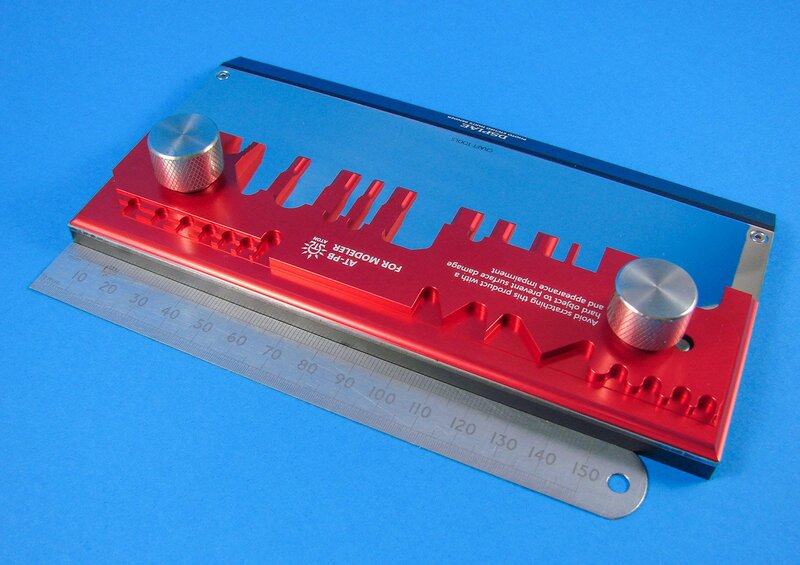 An extremely robust and high-quality tool with unusually high levels of beauty for a functional item. 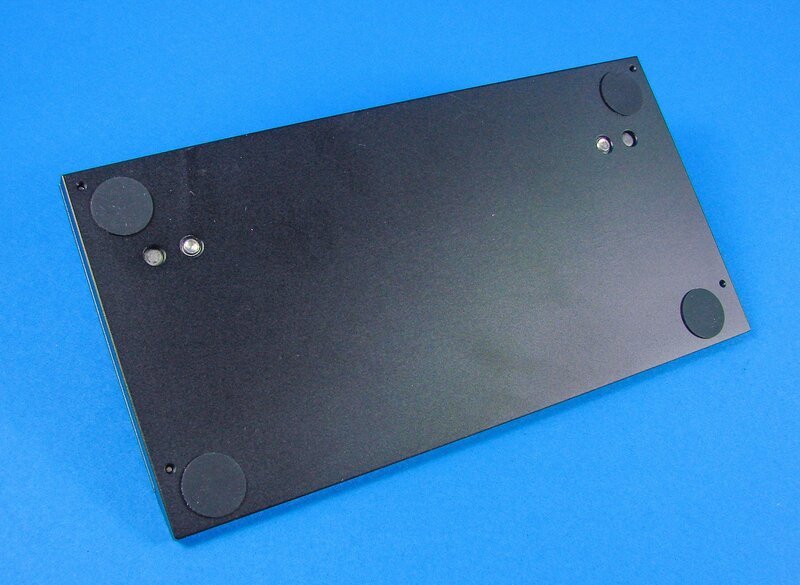 The two choices of working table are a nice touch, and the large overall size of the tool lends itself to some of those longer folds that we something see in our photo-etch parts sets. It’ll be interesting to see how the acrylic folding tools hold up under use, but these can be swapped for something else, should the need arise. The folding tool I got in my 5.5inch Hold and Fold eventually started to rust, so that wasn’t perfect, and I really didn’t want to look at introducing oil to things, especially when I have to paint the folded parts later! Perhaps acrylic is an inspired choice in that respect. 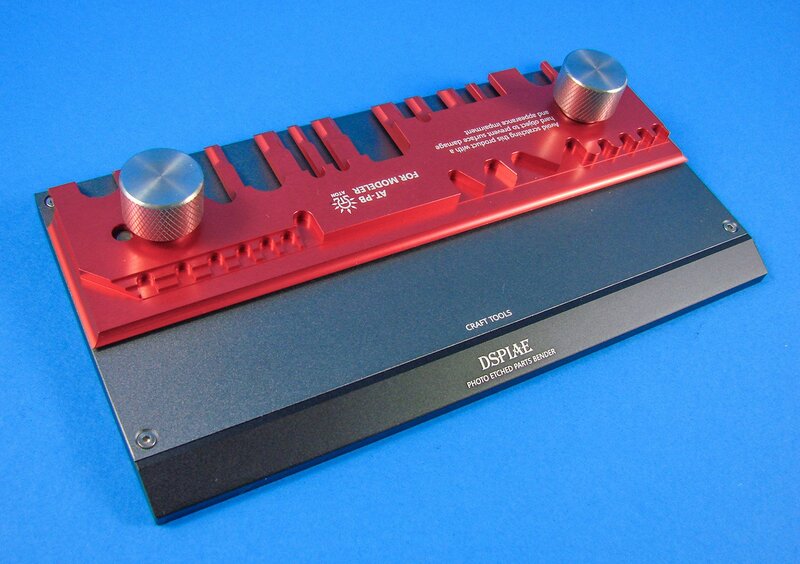 Overall, a stunning new release from DSPIAE and one which, cost-wise, is about on par with other contemporary releases from other companies, but with those little extras thrown in for good measure. Very highly recommended. My sincere thanks to Breveco Modelling for the sample seen in this review. To purchase directly, click the link at the top of this article. I've never actually seen how one of these tools works and would be interested in seeing a demonstration. I'll do a few photos on an upcoming project for you. Very good, have been holding out on the PE bender, I'm glad I waited. I am currently stuck on choosing between the Dspiae or the Shadow thinnerline. If you enjoy building ship models that are historically accurate as well as beautiful, then The Nautical Research Guild (NRG) is just right for you. The Nautical Research Guild has published our world-renowned quarterly magazine, The Nautical Research Journal, since 1955. The pages of the Journal are full of articles by accomplished ship modelers who show you how they create those exquisite details on their models, and by maritime historians who show you the correct details to build. The Journal is available in both print and digital editions. Go to the NRG web site (www.thenrg.org) to download a complimentary digital copy of the Journal. The NRG also publishes plan sets, books and compilations of back issues of the Journal and the former Ships in Scale and Model Ship Builder magazines. Contact us: Please only if you have issues preventing you from logging into MSW!